The holidays are such a sentimental season and I love everything about it. So many memories and lot if food related. 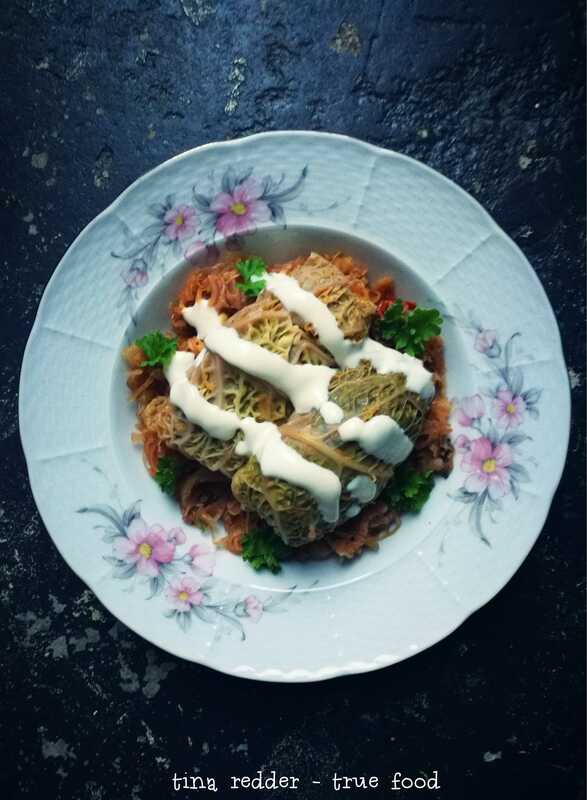 I have been wanting to remake my moms favorite Christmas dish, she used to make this every year. 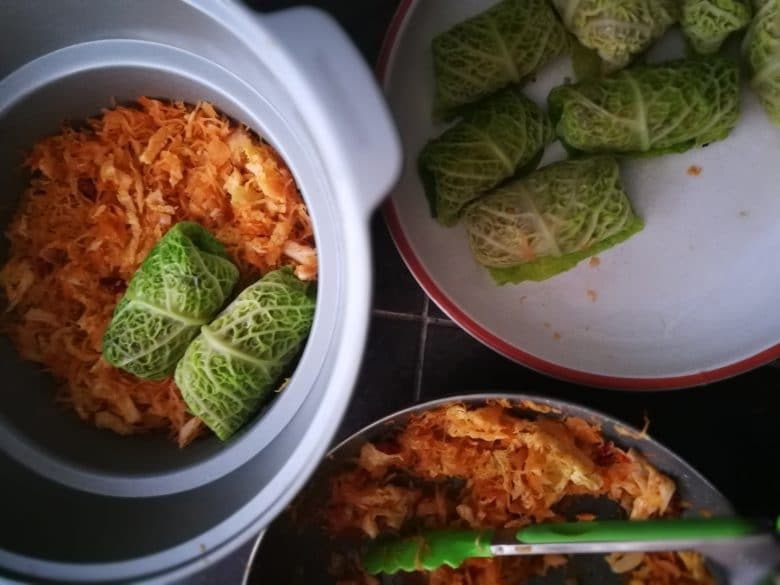 I finally did and I love how these vegan Hungarian cabbage rolls turned out! They for sure remind me of the real deal, very happy with the results. 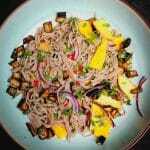 I have of course “veganized” the whole dish, made it low in fat but kept the important flavors in there. 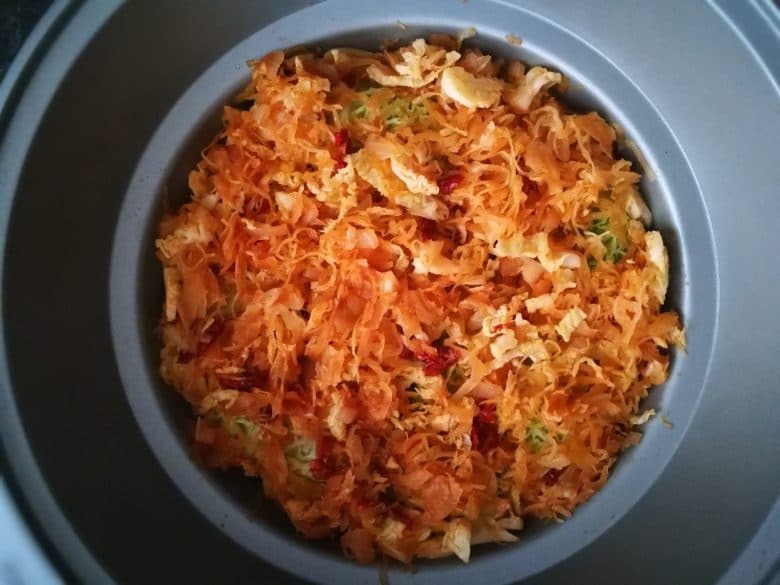 I made my version in a slow cooker but it also can be prepared on a stove top. 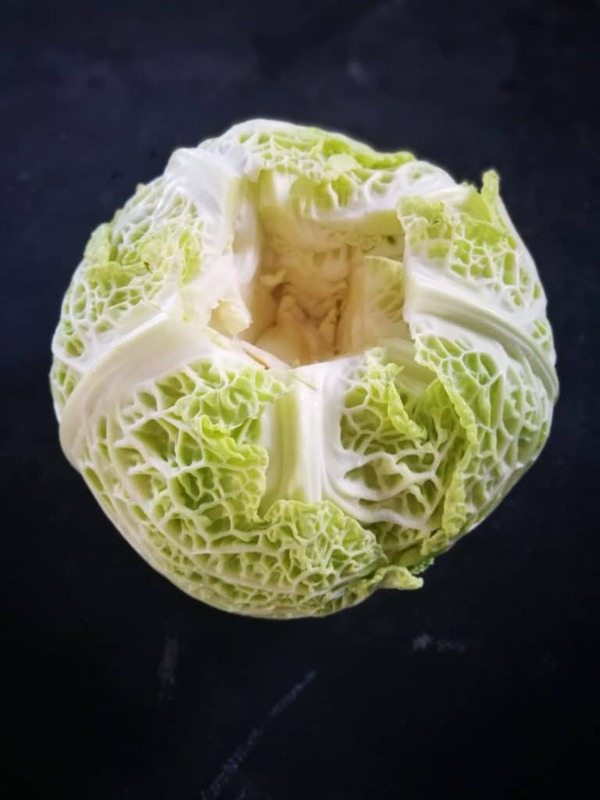 My mom used to make it with a regular green cabbage but I like the structure and color of the savoy kind. Blanching makes it easier to remove the leaves without tearing. I cut out the stem before adding the cabbage into hot water, this way the leaves can be removed easily with a thong. The recipe makes about 8 to 10 rolls so you will be needing as many whole leaves. 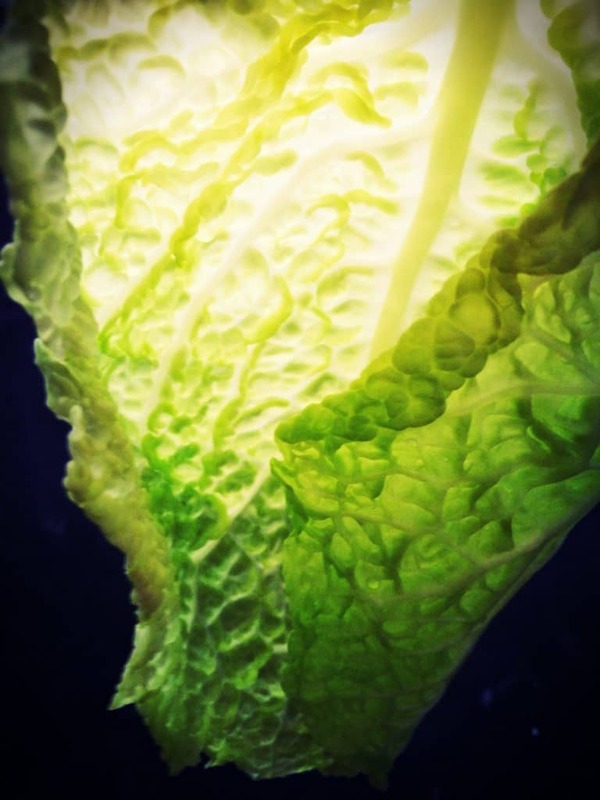 Cabbage is a true power food! Lots of fiber, vitamin K and anthocyanins, both important for healthy brains and brain function. Vitamin C and sulfur aid the body in detoxing. Strong in fighting cancer and inflammation. I decided to use soy curls as the base of the filling. Soy curls are a 100% natural product. Made of just soy beans, they are soaked and then cooked. While cooking they get stirred and when done they are dried into these hard curls/pieces. Nothing added. The only thing we need to do is to re hydrate them before use. 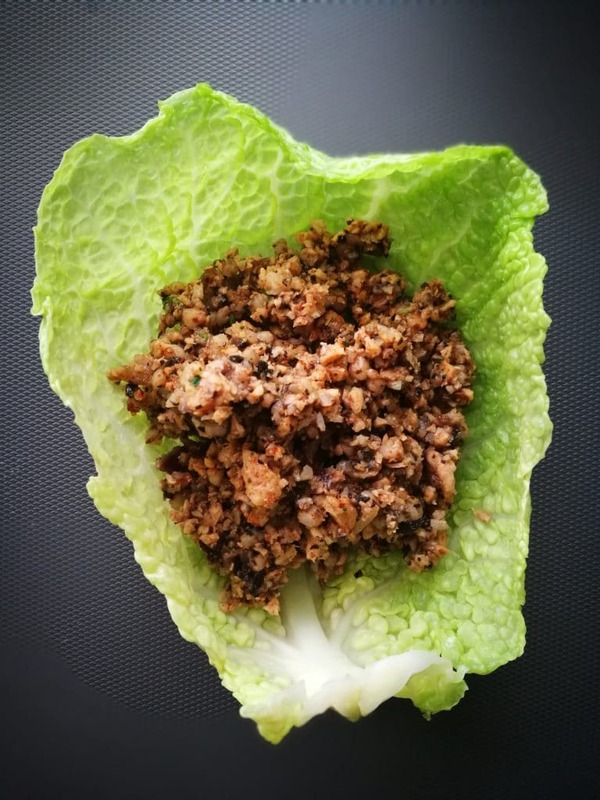 I guess you could also make a soy free filling with may be lentils or use the recipe of the Shiitake Bean Burgers I have on the site adding the seasonings I use here. I used to avoid soy, I still do the processed types, but I have learned much about the benefits of soy from people like dr. Micheal Greger from the How Not To Die book and I do add it to our meals. Things like tofu, tempeh, soy yogurt and soy milk are now a part of our diet, a great source of protein. I made the filling with red onion, mushrooms, parsley, of course paprika powder, a little nutritional yeast and cooked buckwheat. My mom always made them wit rice, next time I will try that too. So making this for our actual Christmas dinner! When the filling was done I pulsed it a bit to make it more stick together. You just have to fill the cabbage leaves and roll them up. 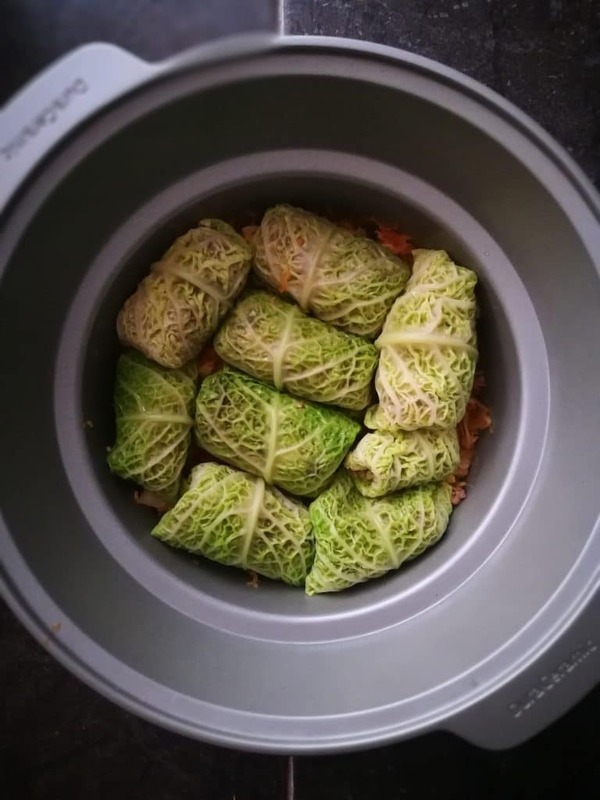 The filling is enough for 10 rolls depending on the size of your cabbage leaves. They lay on a bed of savory cabbage made of the sauerkraut, onion, sun dried tomatoes, smoked paprika and the rest of the cabbage chopped fine. 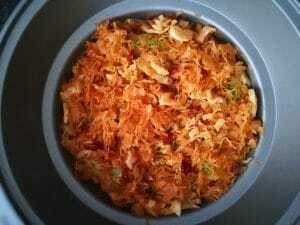 I also saved some of the cabbage to add on top, put the lid on and cooked it on high for 2,5 hours, time challenged. On Christmas I will cook it on low for about 6 to 7 hours. I love my slow cooker for meals like this! I get everything prepared and the cooker takes care of the rest. On crazy days I relay on my appliances! In Hungary they add sour cream to just about everything haha, The meal does need something like that so I mixed some soy yogurt with lemon juice and a little salt to add it on top. You could also make some cashew based sour cream by blending 3/4 of a cup soaked cashews with a 1/4 plus 1 tbsp of water, 1 tbsp. lemon juice and 1 tbsp. apple cider vinegar. Salt to taste. I hope you give this a try and that you love it as much as we do! Let me know if you did. 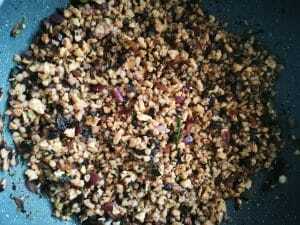 You can find the complete recipe below. 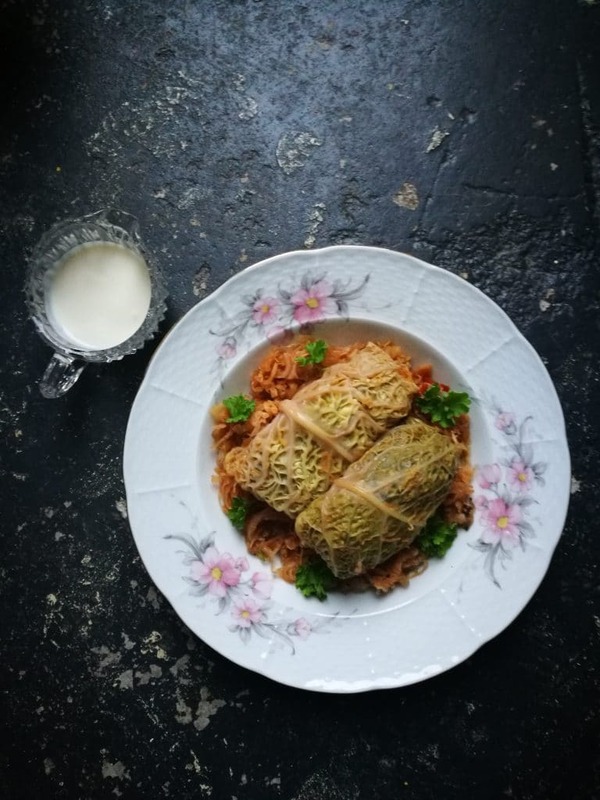 A Christmas classic from my childhood made vegan, bringing back happy holiday memories. Remove the core of the cabbage. Blanche the whole cabbage in hot water for a few minutes until the outer leaves are easy to remove. 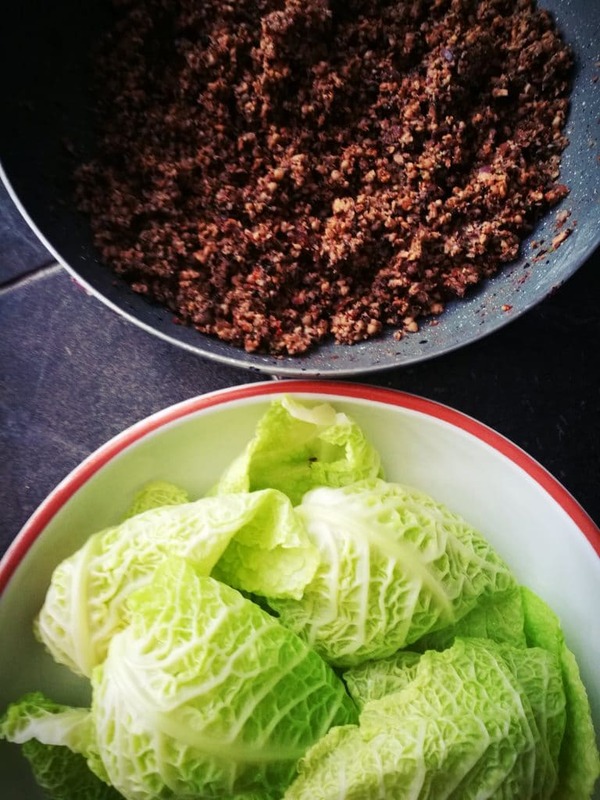 Place the leaves and the inside of the cabbage in a sieve and let it drain. 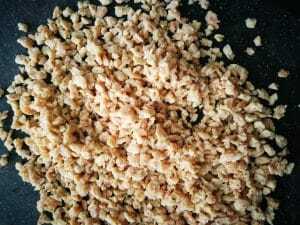 Soak the soy curls in hot water for 30 minutes. Drain and chop a bit finer if needed. Soy curls can differ in size, for this recipe they need to be small. Add the chopped red onion to a hot pan with a tbsp of water and let it soften for a few minutes. Fold in the chopped mushrooms and bake for about 5 minutes. Now add the soy curls, paprika powder, garlic, nutritional yeast, salt and pepper and a few tbsp. of water when needed. 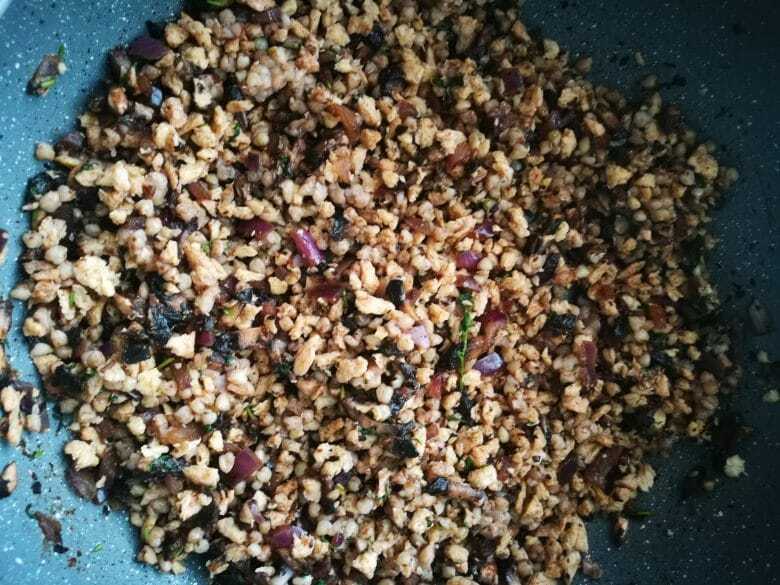 Bake for about 5 minutes, add in the cooked rice or buckwheat and stir until it comes together. Let it cool a bit, then transfer it to a food processor and pulse a few times to make it finer and stick together more. Don't make it into a pulp though! 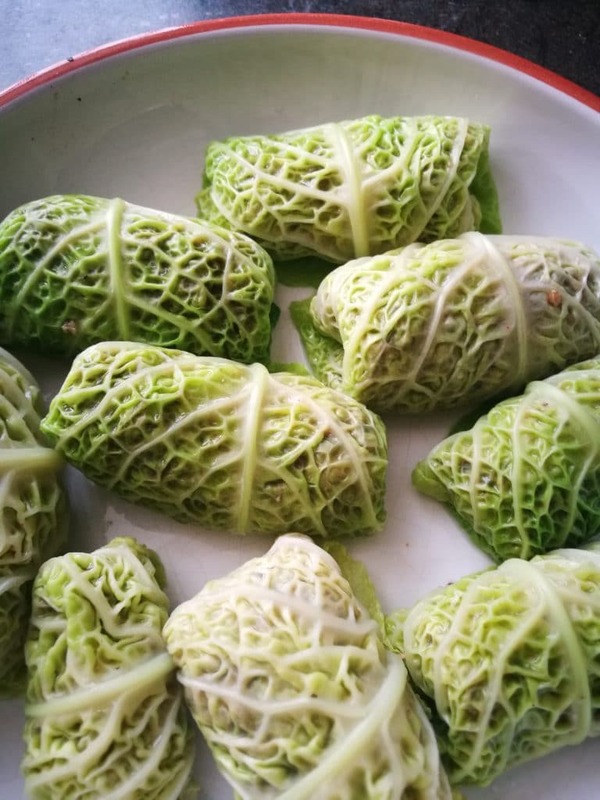 Take a cabbage leaf, add about 1/8 or 1/10 of the filling depending on the amount of rolls you are making. Roll, fold in the two sides and roll further. Chop the remaining cabbage into strips, this will be about 4 cups or so. Wash the sauerkraut to remove some of the sourness and salt. Chop it with a big knife to remove the long threads. Bake the chopped onion with some water until soft. Add in the paprika powder, stir, add in the cabbage, sauerkraut, chopped sun dried tomatoes and stir well. Warm through. Add in maple syrup, I like to add some sweetness with the sour. Taste and season. Scoop the 3/4 of the cabbage into a pan or your slow cooker. 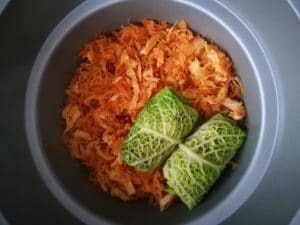 Place the rolls on top and cover with the remaining cabbage. Add in two cups of hot water, including the soaking water from the tomatoes. Cover and let it cook for 2,5 hours on high or 6 hours on low. Delicious with a good sourdough bread! 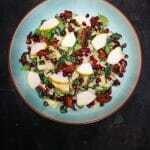 Serve with some of the "sour cream" drizzled on top.